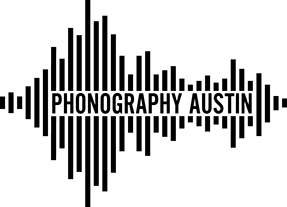 Join Phonography Austin members for an introductory workshop on the art of field recording on Saturday, April 6, 2019 from 11:30AM to 4:30PM. 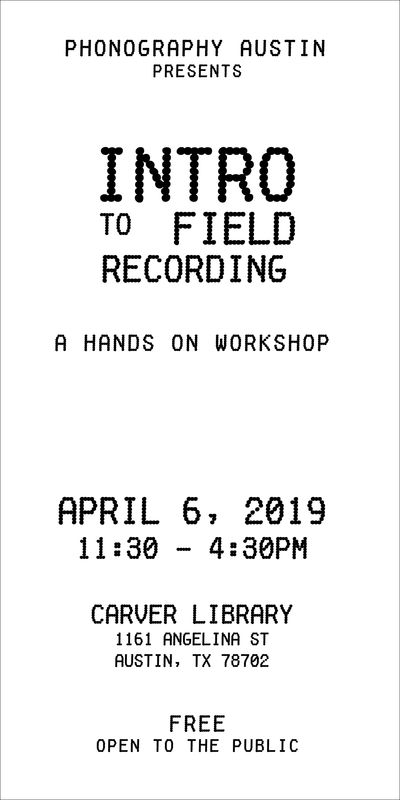 No prior experience is necessary, but participants are encouraged to bring a recording device (a cassette tape recorder, a smartphone, or a digital audio recorder) for hands on practice. This free event is open to the public and will be held at Austin Public Library’s Carver Library Branch, 1161 Angelina Street, Austin, TX, 78702. *Lunch is not provided. Feel free to bring your own lunch or eat out somewhere nearby. Recording Device – a smartphone, cassette tape recorder, miniDisc recorder or other digital audio recorder. If your device does not have a built-in microphone, you will need to provide your own microphone and necessary cables. Pen and Paper – for note-taking. Comfortable Shoes and Clothing – We will be walking around and recording, so please plan accordingly. Optional: headphones, extra batteries for your recorder, a microphone and mic cables for your recorder (if not using built-in microphones), a microphone windscreen and/or a portable mic stand.